Years ago when we lived in Upstate New York I belonged to a monthly gourmet luncheon club. We rotated homes with the hostess chosing the food theme. It was potluck with each guest bringing a dish to share. One Christmas luncheon we gathered at a beautifully restored Victorian home, and the food theme was ‘Your Favorite Christmas Dish.’ Jane brought this ricotta cake, a recipe given to her years earlier by an Italian friend. Everyone who tasted it asked for the recipe and I’ve been making it for at least 25 years. Its roots are in Sicilian cassata, which is a sponge cake layered with sweetened ricotta cannoli cream and covered in marzipan. This recipe is adapted by using items easily available from the grocery store. Bake your favorite yellow or white cake or cake mix in a 9×13 or jelly roll size pan (that is my personal preference), then layer cake with chocolate and cherry-flavored ricotta cheese. Instead of the traditional cassata marzipan topping it is covered with whipped cream, not authentically Sicilian but quite delicious. Be sure to make this cake a day or two before you intend to serve it so the flavors have time to mature. 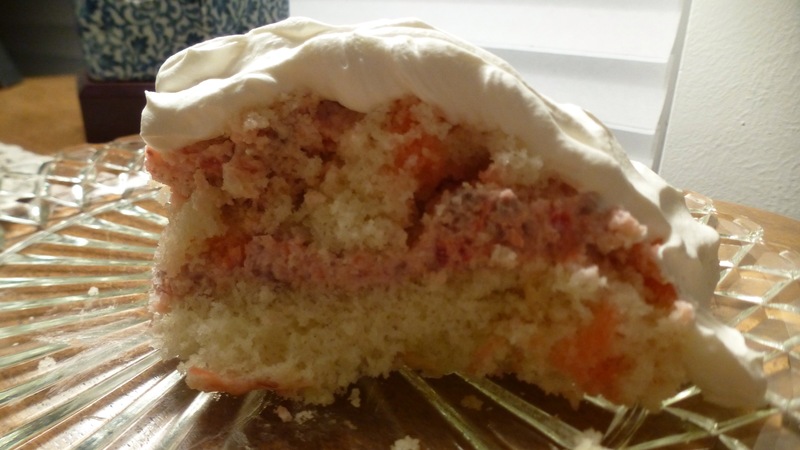 It is a great cake to make for Easter or Christmas with its pretty pink layers. Begin by baking the cake in a greased and parchment paper-lined 9×13 or jelly roll pan. If using a jelly roll size pan bake at 350 degrees for 15 minutes. Bake longer if using a 9×13 pan. Let cool on rack. Prepare the filling by combining in a bowl the ricotta cheese, chopped cherries, chocolate, sugar, and 1/4 cup reserved cherry juice. Mix well. 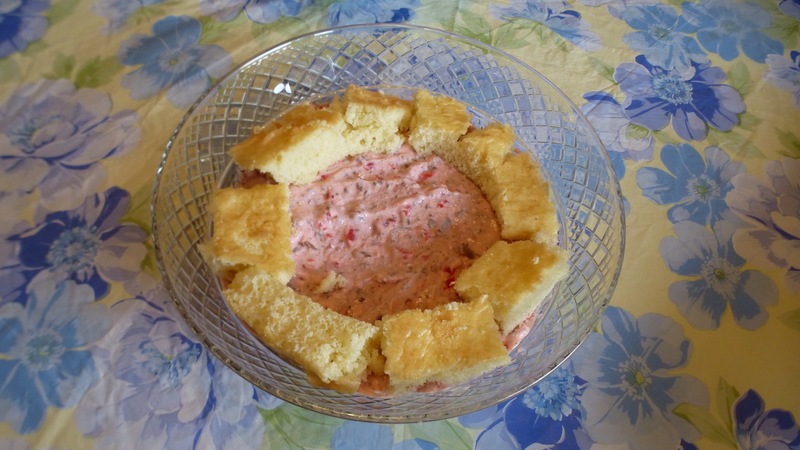 Use a sloping bowl or other bowl of your choice to make the cake layers. Slice 2-3 (1-inch wide) strips of cooled cake and layer them in the bottom of the bowl. 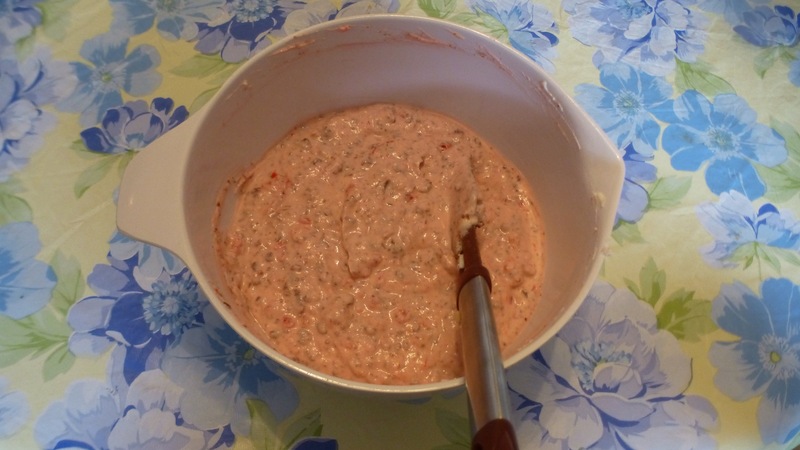 Take 1 cup of filling and spread it over the cake. For the second layer, take three strips of cake and place over ricotta filling. 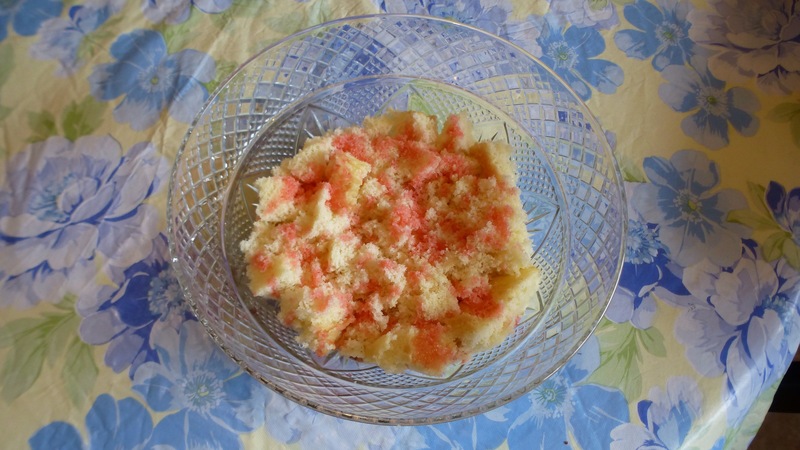 Brush cake with a bit of maraschino cherry juice and spread 1-1/2 cups filling over cake. For the third layer use 3 strips of cake, brush with maraschino cherry juice and spread the remaining ricotta filling over the cake. 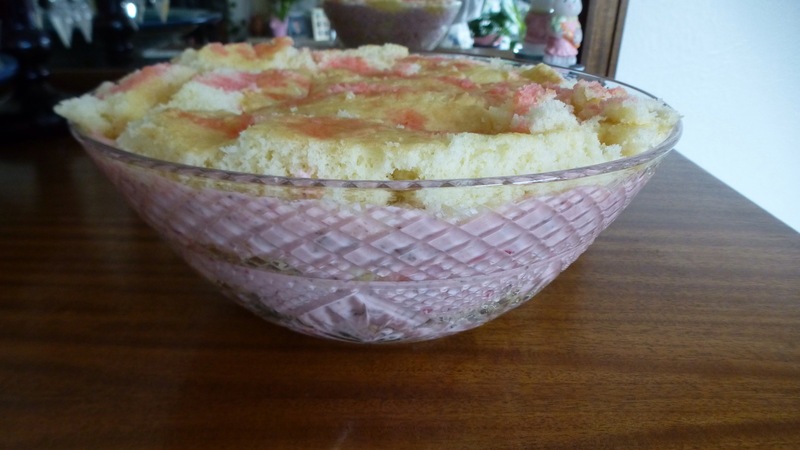 The fourth layer is 4 strips of cake brushed with the remaining maraschino cherry juice. Smash the cake down slightly. Wrap tightly with plastic wrap and chill overnight or several days. When ready to serve, run a knife around the cake to loosen it. Invert onto a cake plate. Whip the cream with confectioners sugar and vanilla to taste. Frost the cake with whipped cream. It is optional to sprinkle frosting with a bit of grated chocolate. Serves 12. This entry was posted in Cakes, Chocolate, Christmas, Desserts, Easter, Thanksgiving. Bookmark the permalink.